Tucked conveniently between Eugene and Cottage Grove along the Interstate 5 corridor, and home to one of the finest municipal airports in the Northwest, Creswell offers a quiet retreat in the South Willamette Valley with easy access to the foothills of the Cascade Mountains. Creswell itself comprises a small downtown district, a few big box stores and shopping strips, and several residential neighborhoods abutting farmlands and crowned by Creswell Butte. 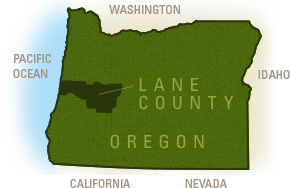 The area around Creswell, Oregon supported the Kalapuyas people prior to the region&apos;s settlement by pioneers and the decimating diseases the Europeans introduced. 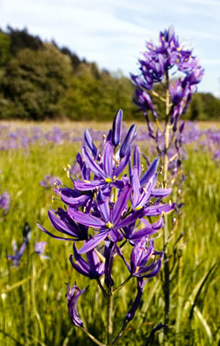 The Kalapuyas made flour from camas lily bulbs and gathered berries, acorns and roots while moving across the verdant Willamette Valley in the spring and summer. They fished and hunted too, and had more permanent villages to which they returned to in winter. The famous 1846 Applegate Trail rolled through Creswell roughly along the same route of the current Highway 99 and I5 (built in 1966). It was touted as a less treacherous journey to Oregon, but was not without it&apos;s own challenges. Several of the town&apos;s present day residents are descendants of the Applegate family, trail-blazer Levi Scott, and other pioneers from the original migrations. A monument to the Applegate Trail can be found at Garden Lake Park. In 1872, Alvin Hughes and James Robinett established homesteads here, and the Creswell Post Office opened a year later with John Creswell as the U.S. Postmaster General. Rail lines connected the community to towns from Oregon to California. The railroad was significant in the community&apos;s economic viability and later the highway and interstate would play that same important role. Airfields for small planes were commonly situated along the Highway 99 corridor which helped pilots sight the runaways. 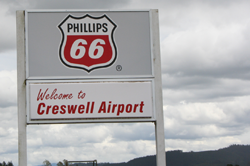 Today, Creswell&apos;s airport remains a vibrant focus for the community. Early on agriculture was the primary industry with wheat, orchards, cattle and pig farms. By the 1900s, in addition to a grist mill, Creswell had a cannery, packing plant, fruit dryer and professional services all along Oregon Avenue. Regional mining and timber also influenced the town&apos;s commerce. 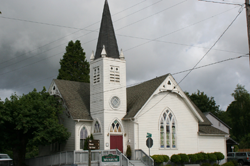 In 1972, the Creswell Area Historical Society was founded to preserve the region&apos;s heritage. The organization operates the Creswell Historical Museum which is open for limited hours seasonally. Creswell continues to be a farming community but has expanded its repertoire to numerous outdoor recreational pursuits. The town is surrounded by hiking trails, mountain biking trails, equestrian-friendly trails, birding areas, fishing spots and various river adventures. In-town highlights include two beautiful community parks, several outdoor murals and a championship golf course.